Ronald F. Geary is a seasoned international finance professional with over 30 years of experience in the areas of global grants and contract management, including expertise in assessment, selection and implementation of accounting software. Ron's work with government, international and domestic organizations has provided him with hands-on experience working with various organizations in more than 25 countries. 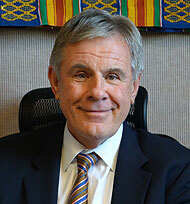 He returns to Jhpiego, where he previously served as Chief Financial Officer and Treasurer from 2008 to 2011. Ron has worked in complex, international organizations of significant sizes in the past, notably CHF International between 2006 and 2008. He most recently served as CFO for IntraHealth in Chapel Hill, North Carolina. Ron has a CPA, MBA and CGMA.